Bruges is Belgium's most popular tourism destination, and with its canals and historic buildings, it's a favorite for culture-vultures. As the nearest large town to the north coast, it makes sense to base yourself here if you want to explore Belgium's coastal region further. As well as comprising a strip of great shoreline with dune-laden beaches, the country's coast is home to pretty resort towns and the wild and wonderful Het Zwin Nature Reserve, which rolls for miles north to the Dutch border. For anyone with a penchant for hiking, biking, or boating, this region is one of the most interesting in the country. Zeebrugge is a popular resort at the western end of the Belgian coast, which is also of interest to travelers visiting Belgium primarily for its First World War history. This port was an important German U-boat base during the war and was at the center of the action on St. George's Day in 1918 when the base was destroyed in a spectacular military assault. The memorial for this event is at the landward end of the breakwater. Early risers here should make their way to the fishing port by 7am to witness the arrival of Zeebrugge's daily flotilla of colorful fishing boats coming in with their catch. Afterwards, there's great local photography opportunities in the fish auction hall where the daily catch is sold from 9:30am. A meander along the seafront (Vismijnstraat) to see the former Belgian lightship and a Russian submarine is a must for visitors. For those who fancy a more nature-filled walk, the coastline from here - extending all the way to Blankenberge - is marked by the Fonteintjes Dunes, which offer ample beach hiking potential. 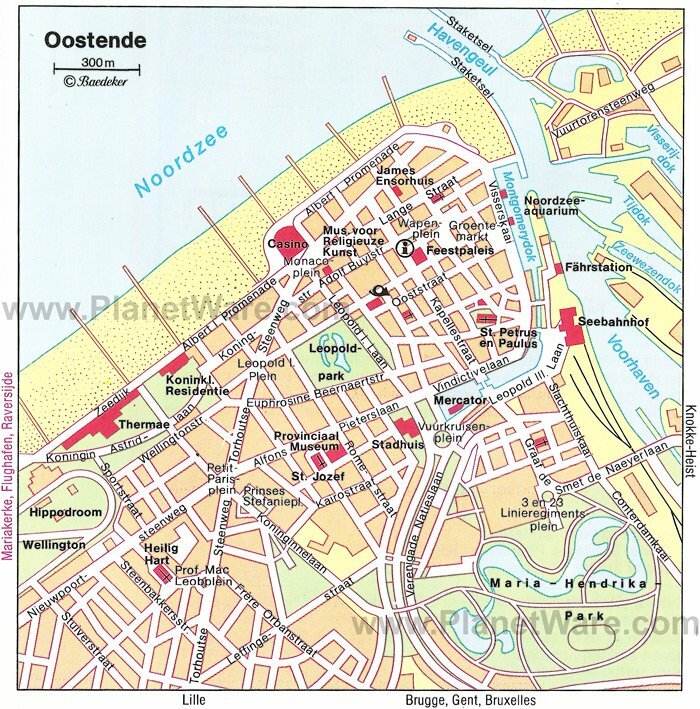 Ostend (in Flemish Oostende) may be the most important ferry harbor in Belgium and the main port for ferry traffic to Great Britain, but it's also one of the most popular seaside resorts in Europe with a history as a major spa destination since the 1930s. During summer, the five beaches here are crowded with local holidaymakers. The most popular strips of sand are the beaches of Mariakerke and Raversijde, west of the racecourse. The main seaside road is Albert I Promenade where history lovers can pause to admire the façade of Ostend Leisure Complex, originally built in 1745 and restored to its former finery in 1953 after suffering destruction during the Second World War. The first floor of the building is decorated with frescoes by Paul Delvaux. For a good overview of the beachscape, walk out to the western breakwater where you can enjoy the best viewpoint in town, while if you stroll west along the promenade, you'll come to the sand dunes of Westende and the royal residence and spa complex. If you want to mix some history and culture into a beach day trip to Ostend, head to the center of the old town where you can view the Feestpalais at the Wapenplein, which was built in 1957 in place of the old town hall, destroyed in the Second World War. On the first floor is the local De Plate Museum, which traces the history of the town through its fishing and resort tourism industries. The second floor of the Feestpalais is home to the Museum of Fine Art, which has a collection of works by James Ensor, Constant Permeke, and other Belgian artists. North of the Wapenplein in Vlaanderenstraat, you can visit the old home of James Ensor, now dedicated to a museum of the local artist's life where many of his personal belongings, sketches, and his studio can be seen. The bulky Gothic Sint-Petrus-en-Pauluskerk in Kapellestraat is another of Ostend Old Town's major attractions. The church now standing dates from 1905, but remnants of the older church, including the 18th century brick Peperbus tower and relics of the 15th century, can still be seen. With its three kilometers of beach, the North Sea coastal resort of Blankenberge first began to attract holidaymakers as long ago as 1860. The town's seafront promenade - known as the Zeedijk - runs along the coast here and is packed with walkers, bathers, and tourists during the summer months. At the eastern end of the promenade are the Lustige Velodroom cycling track and Sea Life Blankenberge with aquariums, both popular attractions with visiting families. When you've had your fill of beach time and want to soak up some culture rather than sun, head to the Gothic Sint-Antoniuskerk, near the train station, which was first consecrated in 1358 and restored during the 17th century. Together with Ostend, Knokke-Heist, near the Dutch border, is probably the most elegant seaside resort in Belgium, with its broad 12-kilometer-long beach that comprises one fifth of the Belgian coastline and boasts an attractive landscape of dunes. For visitors as interested in activities as they are in beach-lounging, Knokke-Heist Beach has excellent walking, hiking, and cycling potential. There are 10 cycle trails in the area and several walking trails. Two of the the best walks in the area are the Landelijke Knokke and the Polderwandeling, which both lead through the sand dunes. There is more to explore in the town of Knokke, than just its famous beach. History fans visiting in summer should seek out the For Freedom Museum (91 Ramskapellestraat), which displays a series of exhibits and dioramas that tell the story of the battles of Flanders in World War II and the effect on the towns and villages of the region. The museum is unfortunately closed during the winter months of November to March. For those more interested in nature, the town's Butterfly Park gives you a chance to view hundreds of brightly colored butterflies up close and personal. The Het Zwin nature reserve stretches from the end of Het Zoute over the Belgian-Dutch border. Some two fifths of the 150 hectares are accessible to walkers. Het Zwin is now the silted inlet that once made Bruges one of the richest harbours in Europe. Today, the countryside, bordered by dunes and the sea dike and criss-crossed by tidal rivulets, provides a unique habitat for plants and animals. More than 100 species of birds nest in Zwin, among which are waders, ducks, the silver plover, and snipe. At the entrance to the nature reserve, the indigenous species are kept on several ponds and in aviaries so that visitors can see many of the birds at close hand without disturbing those in the wild. The best times to visit are in spring to see the birds, and in July and August when the ground is covered with a sea of blossoms known as the "Zwinneblomme." In Gistel, 10 kilometers south of Ostend, St. Godelieve was born in 1045. Her husband had her strangled in 1070 and threw the body into a pond, and from then on, the water was thought to have miraculous powers. The church and the museum here are dedicated to the legend of St. Godelieve. While here, don't forget to visit the pretty whitewashed abbey of Ten Putte outside Gistel, which was laid out around the wonder-working pond. Here, you can visit the cellar where Godelieve was incarcerated, as well as the chapel on the spot of her first miracle. The charming little Flemish town of Damme lies about 7 kilometers northeast of Bruges. Up until the silting of the Zwin inlet, it served as the customs point and outer port of Bruges and enjoyed great importance and prosperity. Its heyday only lasted about 200 years, but several significant buildings still remain from this period, which have kept the image of a medieval Flemish town alive. In particular, the magnificent Gothic Town Hall (Stadhuis), built by Gottfried von Bosschere in 1464-1468, with statuary decorating the façade and interior doorways carved with historic scenes is well worth visiting. The impressive Church of Our Lady with its 45-meter-high tower and choir hall from the Middle Ages is also one of Damme's top highlights. The church's interior houses valuable figures of the apostles carved in oak from 1400. For a pretty stroll on a sunny day, the trails alongside the Schipdonkkanaal are a great destination, and for those who want to get onto the waterway, this is one of the best canals for a scenic boat ride. The Schipdonkkanaal is a branch canal for the Leie, and the canal leads north of Damme in a northwest direction to Zeebrugge. The two straight courses of the canal flow through a scenic route studded with endless rows of poplars providing a wonderfully peaceful tableaux for the entire route.